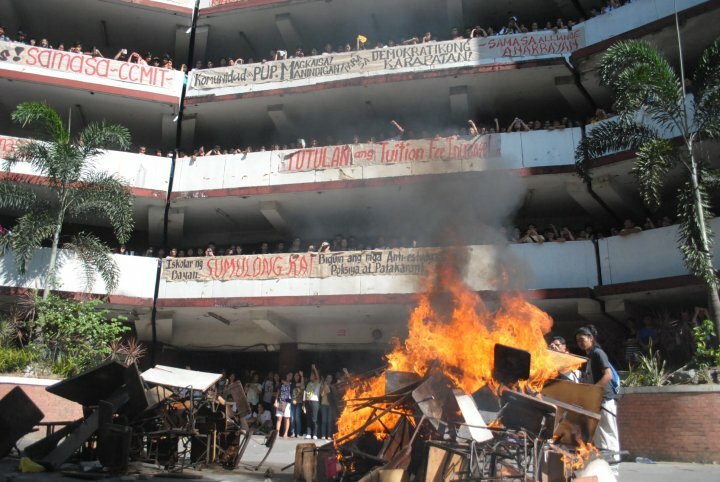 Thanks to the intense and “fiery” student protests, the Commission on Higher Education (CHED) chair was forced to issue a statement he will not allow the planned hike in the Polytechnic University of the Philippines’ (PUP) tuition by an outrageous 1,567 percent (P12 to P200 per unit). Otherwise, incoming PUP freshmen, which the PUP administration claims are the ones to be affected by the tuition hike, will be forced to pay exorbitant fees. And worse, these freshmen – like those before them – will discover four, five years later (if they manage to graduate amid the progressively increasing tuition and other costs) that no job awaits them. This is another dimension in the increasingly commercialized tertiary education in the country – as state colleges and private universities squeeze students and their parents dry, government could not even guarantee employment for the college graduates. Consider these numbers. For every 2 new college graduates produced in the last 8 years, only 1 job that befits the skills and qualifications of these degree holders is added to the domestic labor market. And they will have to compete for this job with the unemployed college graduates from previous years. Dr. Romulo Virola, Secretary General of the National Statistical Coordination Board (NSCB), devised a method to estimate the capacity of the labor market to absorb the graduates of tertiary schools. He related the number of tertiary graduates with new hires by major occupation group. Virola deducted the employment for laborers and unskilled workers, farmers, forestry workers, fishermen, and plant operators based on the assumption that college graduates will apply for work only in the other occupation groups. He estimated the number of new hires by obtaining the difference in employment between the present year and the previous year. Finally, Virola divided the number of new hires with the number of tertiary graduates. 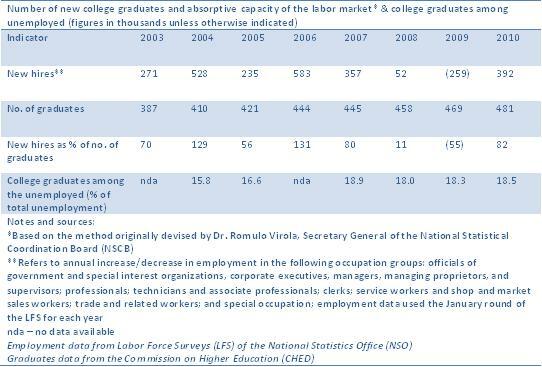 Using this method, processed data from the Labor Force Survey (LFS, January rounds) of the National Statistics Office (NSO) and the CHED will show that from 2003 to 2010 (variables for earlier years are incomplete), the number of new hires as a percentage of the total number of college graduates is pegged at only 63 percent per year. This suggests a very tight labor market for the country’s new graduates, which reach more than 439,000 annually in the last eight years. The number of new jobs created every year in occupation groups where the college graduates may want to apply for such as officials of government and special interest organizations, corporate executives, managers, managing proprietors, and supervisors; professionals; technicians and associate professionals; clerks; service workers and shop and market sales workers; and trade and related workers is pegged at only less than 270,000. Note also that the portion of college graduates among the ranks of the unemployed has been increasing through the years. Available data show that from 15.8 percent in 2004, the portion of college graduates among the unemployed has increased to more than 18 percent annually in the last four years. So where will our college graduates go? Call center? New call center jobs are expected to drop dramatically this year – from 50,000 in 2008 to just 10,000 in 2010, according to an ANC news report. Work abroad? The number of newly hired land-based overseas Filipino workers (OFWs) declined by 30 percent between 2007 (306,383 new hires) and 2008 (216,803). Or just follow former National Economic and Development Authority (NEDA) chief and now Liberal Party senatoriable Ralph Recto’s advise to graduates last year – “do not look for work, go back to school” – because the backward Philippine economy and the recession-hit global economy could not produce jobs? Congratulations, graduates. Welcome to the real world. → gaano katagal ang dalawang buwan ng kalayaang dinukot?